Acoma Pueblo in New Mexico is intriquing. Down below on the desert floor, at Sky City Cultural Center, I gladly paid the fee to take photos. After all, we were invited guests. 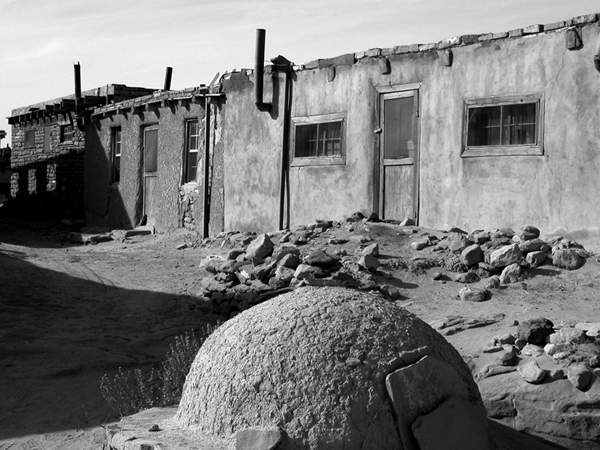 The little village atop the mesa is the center of the Acoma culture, a sacred place to its people. The Acoma artisans are good at what they do, making a style of pottery highly prized by collectors. We purchased a few treasures, and wished we had bought more. But I also treasure the photos I shot ... some looking out on the vast spaces beyond the homes on the high cliffs, and others looking inward, down the rough walkways and alleys between the adobe brick homes that have sheltered generations of families. This shot in the center of the village features one of the familiar mud ovens used for baking bread. If you go, take the tour, buy directly from the artists, and be respectful in how you wield your camera.